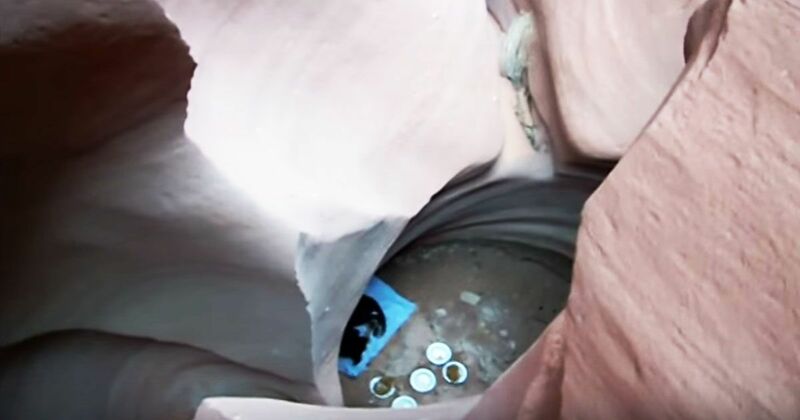 While on a solo hiking and rappelling adventure through the slot canyons near Page, Arizona, Zak Anderegg dropped into a deep "pot hole" that was at the bottom of a 350-foot (106.7-meter) canyon and made a discovery that would change two lives forever. 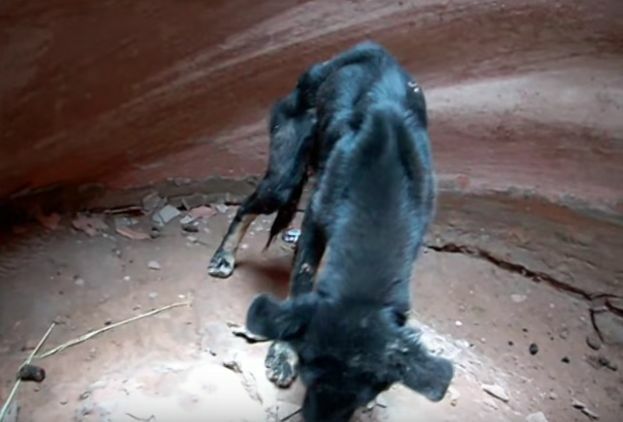 A small, dark puppy was at the bottom of the hole, alone and starving. He was so weak that he could barely move, but he did manage to stand when Anderegg brought him some food and water — after Anderegg climbed out of the 20-foot hole to get it and then rappelled back down. Anderegg returned the next day with the equipment needed to haul the young dog out of the hole. After completing the dangerous rescue alone, the former Marine sergeant immediately took the emaciated animal to a veterinary hospital. The veterinarians treated the puppy for dehydration. An examination revealed that the dog also had three shotgun pellets under his skin and darkened teeth that indicated long-term malnutrition. This seemed to confirm Anderegg's suspicion that the puppy, now being called Riley, had been purposely abandoned in the pot hole. "As far as I'm concerned, the only way he got here without any broken legs is someone actually put him here," Anderegg says on video taken during the rescue, explaining why it is unlikely that the pup was carried in during a flash flood. Two days after the rescue, Riley was cleared for a long drive home with Anderegg to Salt Lake City. He was still too weak to stand, but his tail wagged just enough to let Anderegg know that he would be okay. Within weeks, Riley was recovered enough to enjoy trips to the park and other outings with Anderegg, his wife and their other dog, Riley's new "big brother." The video documenting the rescue and following Riley's recovery has garnered more than 4.8 million views on YouTube. "Riley has made a full recovery, both in body and spirit," the video concludes. "He has left the past where it belongs and romps into the future with his family." Anderegg's book,"Rescuing Riley, Saving Myself: A Man and His Dog's Struggle to Find Salvation" tells the story of Riley's rescue and how it helped Anderegg overcome some of his own lifelong struggles.